IS IT POSSIBLE TO OVERDOSE ON CANNABIS? Can humans overdose on cannabis? No. The number of individuals who have died due to cannabis overdose, in all of recorded history, is zero (0). That’s one of the most well-known facts in the cannabis library. But is it really true? And if so, why? Yes, it’s true. Cannabis itself cannot kill the human body. But let’s be clear: It is very possible to “overdose” on cannabis in the sense of over consumption. Most experienced cannabis consumers have, at one point or another, gotten themselves to a place they didn’t want to be. You didn’t check the dosage on that edible, and now you’re regretting it. You’re uncomfortable. You may be feeling downright miserable. It’s okay. You’re not going to die. It will pass. Lesson learned. It’s possible to die from opioid overdose or alcohol poisoning. But cannabis acts on the body and mind in a way that’s very different from opioids or alcohol. We’re all familiar with the tragic phrase “died of an overdose,” but when opioids like fentanyl, Oxycontin, or heroin are the cause, there’s a specific mechanism that leads to death. As Oxford University anesthesiology professor K.T.S. Pattinson has observed, “In drug addicts, respiratory depression is the major cause of death.” In other words, during an opioid overdose the victim falls unconscious and the body forgets to breathe. What scientists call “the fundamental drive to respiration”—i.e., what tells the body to breathe—originates low in the brainstem, in an area known as the pre-Bötzinger complex. Opioids don’t just suppress pain and increase feelings of pleasure; they also depress the pre-Bötzinger complex, which causes breathing to become slow and irregular. In an overdose, breathing shuts down completely and death occurs due to lack of oxygen. 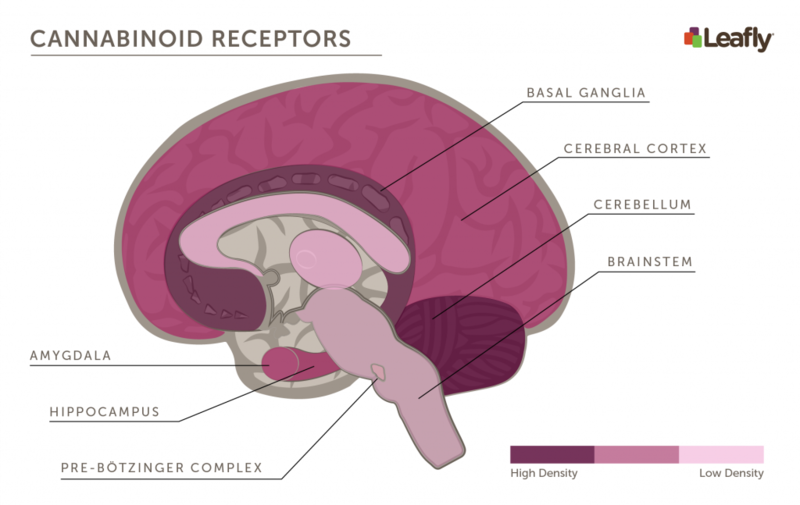 Opioid receptors are found in many areas of the brain, including the pre-Bötzinger complex in the brainstem, which controls breathing. This is a major reason why opioid overdose can be deadly, as opioids affect this critical brainstem region. In some cases, an opioid overdose can also depress the brain’s mechanism that regulates the heart and blood circulation, leading to a drop in blood pressure and heart failure. Alcohol poisoning can become lethal when the alcohol overwhelms the liver’s ability to clear it, and alcohol in the blood anesthetizes those same brain systems that regulate breathing and blood pressure. They shut down, which leads to death. Why doesn’t cannabis have the same effect? Because cannabinoids act on specific receptors that are not concentrated in the brainstem, where breathing and heart rate are controlled. Cannabinoid receptors are most highly concentrated in the basal ganglia, the hippocampus, and cerebellum, which control cognition and movement. Those same receptors appear in scant numbers in brainstem areas like the pre-Bötzinger complex. Brain areas with high densities of cannabinoid receptors. This map is not meant to be comprehensive. Compare it with the opioid receptor map above to highlight some of the key similarities and differences between opioid and cannabinoid receptor densities. Cannabinoid receptors are also found in many areas of the brain, but not so much in the breathing center of the brainstem (pre-Bötzinger complex). 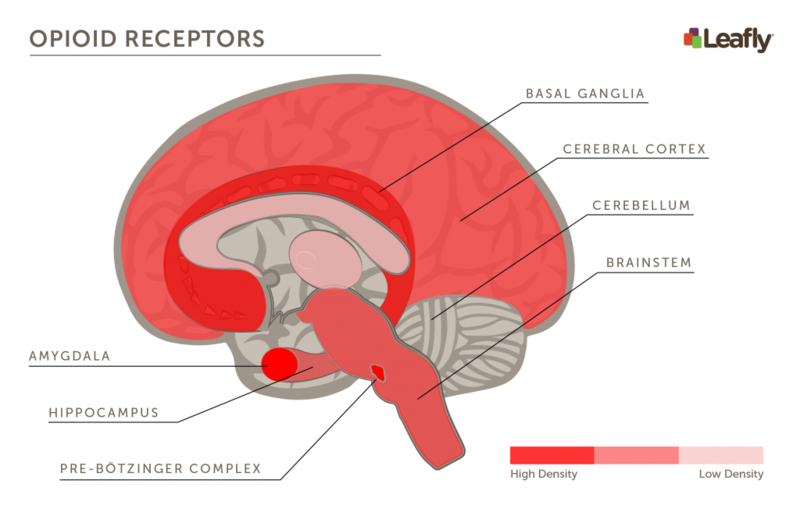 CB1 receptors, one of the most abundant receptors in the brain, are found in many regions. To summarize, opioid and alcohol overdose can shut down the body’s breathing and blood circulatory systems that are located in the lower brain stem. Cannabis does not have the ability to affect those lower brain stem systems in the same way. While it is very possible to overdo your cannabis intake, it’s not possible to die from a cannabis overdose. Herkenham M, Lynn AB, Little MD, et al. Cannabinoid receptor localization in brain. Proc Natl Acad Sci USA. 1990;87(5):1932-6. Le merrer J, Becker JA, Befort K, Kieffer BL. Reward processing by the opioid system in the brain. Physiol Rev. 2009;89(4):1379-412. To stay informed with YourCannaLife & the Cannabis Industry please enter your name & email to subscribe to our mailing list. YourCannaLife is a Cannabis Industry Consulting Service. If you’re considering entering the Cannabis Industry please feel free to contact us by filling out the contact form down below. We assist your business venture from start to finish. Currently YourCannaLife has access to hundreds of thousand of cannabis followers, patients, customers & etc. All thanks to our network. We’re able to send you social media analytics to support these claims upon request. If you would like to interact with us on social media you’re more than welcome to join our Facebook group. Share and leave your comments down below. I am interested investing in this business but there so much information, i was wondering if penny stock can be one but too much info is out there. What level of investing are you seeking to be involved in? Would you be interested investing in business that cannabis related that are looking for investors?